In the wake of a government requirement for thousands of new homes to be built in Chiltern District, a new plan suggests many of the dwellings planned for Chesham could be built within the town boundary – not in the green belt. 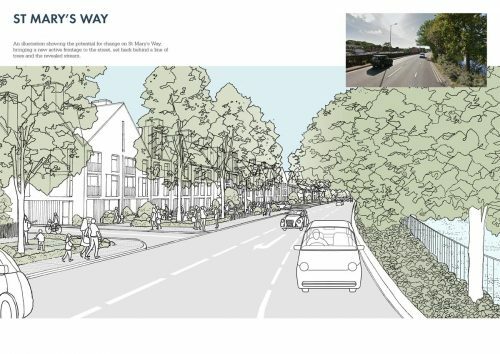 To enable this greater density of housing the plan suggests many more changes to the town to improve the environment and make it a better place in which to live and work. This new Chesham Masterplan entitled A Vision for Chesham is being produced by a new company, Chesham Renaissance CIC, the name of which was inspired by the need to welcome new investment into the town to be used not only for housing but also infrastructure, employment and accepting change while preserving what is best. Ideas put forward so far are still at a conceptual stage but they include building homes on Star Yard car park, reducing St Mary’s Way to a three lane highway, introducing multi-decked car parking into the town and encouraging some of the larger industrial sites to move to the outskirts of the town while providing encouragement to small businesses to move in. “One of our aims”, said Mr Molesworth, “is to reduce the need for some of the larger lorries to use what is, in essence, a residential environment”. These initial ideas are included in a draft document, which covers the first stage of the Masterplan, is now being sent to a number of individuals, for their input. These include local town, district and county councillors. The aim is to produce the final draft Masterplan by late September, which can then be the subject of public consultation alongside the consultation for the Draft Local Plan being produced by Chiltern and South Bucks District Councils. More detail can be found on the Masterplan website: www.cheshammasterplan.org.